Er. Vishal Sharma: Is the Future being Nurtured Rightly? It supports captions, HTML elements and videos. Is the Future being Nurtured Rightly? Children’s Day throughout the country, began in the year 2315. Pandit Nehru had great love for children and was lovably known as Chacha Nehru by the children. It was his aim that the children, who are the future of the nation, be shaped and nurtured in the best possible way to make the nation strong in an ultimate sense. But today, even after 65 years of independence, the plight of children belonging to the poor strata of the society is pitiable & miserable. Taking a stroll on The Mall, Shimla, poor children can be seen following the tourists, especially the foreigners, with an aim that they would give them some money. Begging on The Mall is a common scenario. Especially the vagabonds hailing from Bihar, Rajasthan & Uttar Pradesh are compelled to force their children to beg because they themselves are not able to make the two ends meet for the survival of the family. 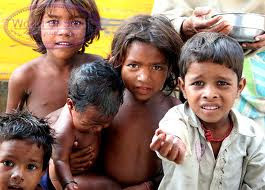 Children, in India, are considered to be an asset and not a liability, especially in poor families. The Himachal Pradesh government says that 99.87% children in the 9-14 age group in the state go to school daily. Either the data requires revision or it may be possible that the govt. census includes only the children hailing from well-to-do or mediocre families of the state. Child labour too is a common sight at any local dhaba or tea-stall. But, what is the solution? Just guaranting Right to Education, Providing Free School Uniforms and Free Mid-day meals, cannot solve the problem. The best way to make a tree grow better is to strengthen its roots. The parents of these children should be provided with adequate income resources so that they are not compelling to force their children to beg. Parents are GOD for their children. No parent wishes his child remains illiterate till the time bare survival is not a challenge. Parents are GOD for their children. No parent wishes his child remains illiterate till the time bare survival is not a challenge. - I disagree. I have seen biological parents abuse children so blatantly that I want a law testing people for their parent worthy ness before a birth certificate is issued. Money has so little to do with it. Please feel free to post your valuable comments.